The so-called "Lucky Lotto Bandits." San Jose police said Thursday that suspects arrested at Travis Air Force Base in Fairfield last month are linked to more than 30 gas station and convenience store burglaries in the South Bay and elsewhere dating back to September. Dubbed by police as the "Lucky Lotto Bandits," the group often used a rock to smash the window of a business to gain entry, and frequently stole California Lottery Scratchers tickets, cash registers, U.S. currency and cigarettes, police said. The burglary spree ended early on the morning of Dec. 20, when Santa Clara police were seeking 21-year-old Jared McEssy and learned he and four other people were in a gas station parking lot in Fairfield. Fairfield police tried to pull the suspect vehicle over but they fled in it, prompting a pursuit in which the suspects struck another vehicle and ran several red lights, Santa Clara police said. The officers stopped the pursuit but learned a short time later that the vehicle had driven through the main gate of Travis Air Force Base and were on the loose inside the base, Santa Clara police said. The suspects abandoned the vehicle but all five were eventually found and arrested after a search that lasted a couple of hours, according to police. A sawed-off shotgun was also found in their vehicle. 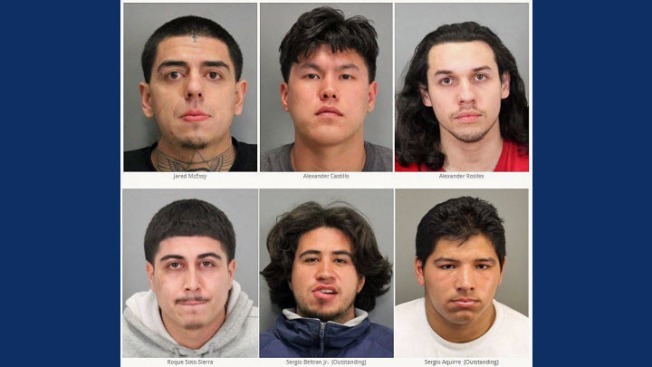 Along with McEssy, San Jose police Thursday identified San Jose resident Alexander Castillo, 21, Stockton resident Alexander Rosiles, 19, Stockton resident Roque Soto Sierra, 19, and Stockton resident Sergio Beltran Jr., 21, as the other four suspects arrested in Fairfield. The crew is suspected of burglaries in San Jose, Santa Clara, Campbell, Cupertino, Sunnyvale, Los Altos, Fremont, Livermore, Dublin, San Ramon, Danville, Tracy, Brentwood, Rio Vista, Elk Grove, Rancho Cordova and in Calaveras County, San Jose police said. McEssy pleaded guilty on Jan. 3 to 32 counts of commercial burglary, according to police. Police said Beltran is now at large with a felony warrant for his arrest. They have identified an additional suspect, 18-year-old San Jose resident Sergio Aguirre, as being a part of the "Lucky Lotto Bandits," and he is also at large with a felony warrant for his arrest. Anyone with information about the burglaries or suspects is asked to contact Detective Ashley Weger at (408) 277-4401. Those wishing to remain anonymous can call the Crime Stoppers tip line at (408) 947-7867 or click the Submit A Tip link on the San Jose police website. People providing information leading to the arrest and conviction of the suspect wanted may be eligible for a cash reward from the Silicon Valley Crime Stoppers.